Not really what chaos elves look like, but Pirotess fits the bill. Honestly, I simply didn’t want to use Trinity again. Anyway, the strange thing is that I’ve never really gone into the history of this species. At least not on the blog, which is strange since a chaos elf is the first enemy you meet in Beginning of a Hero. These assassins, spies, and thieves routinely appear to cause trouble or throw a few surprises into the path of our heroes and even a few other villains. Within the pages of Allure of the Gypsies, you get an idea of what life is like for the chaos elves. They come from the desolate continent of Shayd, which is ruled by Baron Kernaghan. Undead and demons are constant threats to them while they dig for edible roots or wait for a mission that will allow them to prove themselves. It’s amazing that they have survived such conditions, but the chaos elves have become very tough to withstand the centuries of abuse. Their master makes sure they are still strong enough to be useful and they breed quicker than most species, which helps avoid extinction. The trade off is that they obey a sinister being and have a reputation throughout Windemere for being completely evil. So, where did the chaos elves come from? 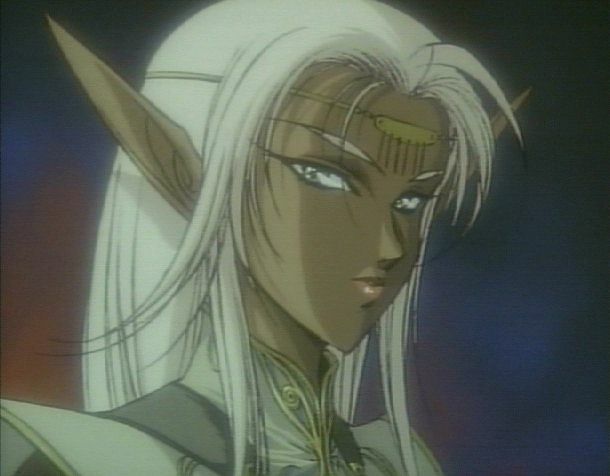 Long ago, the original elves were called Hejinn and were infected with demon blood. The Hejinn conquered the world, wiped out the original Orcs to avoid competition, enslaved a god, elevated a demon to near god status, and threatened to destroy all of Windemere. Their defeat was accomplished by some of them fighting their demonic nature and leading the other species to victory. Yet, not all of the Hejinn who fought their nature got involved in the fight. Many of the turned ones settled for playing both sides or staying out of the war. These were the precursors to the chaos elves, who were cursed by the gods to remain closer to their demonic ancestry than the other elves. Instead of being corrupt and evil like the Hejinn, they have a desire to play malicious pranks and cause mischief in other countries. This didn’t help their reputation, but they were merely seen as annoyances and untrustworthy. Not the ‘capture on sight’ mentality that tends to be aimed at them. It was when the Baron expanded his prison and gained influence over Shayd that the chaos elves became assassins. When the Great Cataclysm occurred, he stepped out and took over the continent by killing the current rulers. He also destroyed their temples to prove that their goddess couldn’t stop him. All of the rulers were nothing more than pawns of the Baron and they lasted only as long as he needed them. The one exception is Queen Trinity, who is more powerful than her predecessors and has fought to earn a better way of life for her people. This is why the chaos elves are actually more loyal to her than the Baron, which is an important factor in Tribe of the Snow Tiger. So while it is mostly a story about Timoran Wrath, there are other characters that are going to evolve. There is some connection between them too, but that’s a surprise. Without spoiling anything, the chaos elf nation and Queen Trinity will have a big decision to make that will change everything about their lifestyle. You really get to see the toughness and honor among these hated people. Will it lead to a flicker of redemption? I can’t say because I’m not exactly sure. The fate of the chaos elves will depend on who wins the final battle. If the champions win then the chaos elves are free to control their own lives, but it’s unclear how the rest of the world will take to that. They might be seen as conspirators and be hunted down or contained. On the other hand, they could end up rehabilitated and accepted after some diplomacy. Hard to say since a lot of it depends on what Trinity will do. Under the Baron’s rule, they would become the new noble class and live across the globe to enforce his laws. A big part of this is the promise that they can be ‘in the light’, which is something every chaos elf dreams of. It’s even why they throw their dead off the edge of the continent and into the ocean. The hope is that the deceased will float into the light before sinking or maybe even reach a distant shore. The nuances of the chaos elves are within the books and they’ll always be one of my favorite species to work with. There’s a strong desire to survive in them that makes them intriguing characters. Some of them are the types that shouldn’t be trusted while others hold onto a sense of honor that would rival Timoran. A lot of this stems from how they react toward Trinity, who is probably the most beloved ruler in all of Windemere. They wouldn’t only kill and die for her, but the chaos elves would stand up to a god if they felt their Queen was threatened. Makes you wonder just how their world is going to change in the next book. This entry was posted in Legends of Windemere and tagged author, chaos elves, elves, epic fantasy, fantasy, fiction, high fantasy, history, Legends of Windemere, magic, Queen Trinity, sword & sorcery, Trinity, Windemere, writing. Bookmark the permalink. Very cool characters, and lots of intrigue here. Thanks. Happy to give them a spotlight in the next book. I think the chaos elves are a very interesting species. Love that such horrible conditions toughened them and helped them to survive. It’s fun to write them because of that toughness and a desire to escape their plight. Hoping to make a chaos elf hero at some point. This was very well done. Makes me want to reach for the book when it comes out. (maybe that was the intent.) In any case it was nice learning more about chaos elves. Love all the backstory and world building. It makes stories so much richer. Thanks. Happy to hear that it brings depth to the tales. Especially since I can’t always put the information into a story without it being an info dump or out of place. Thanks for this very interesting history of the chaos elves. I am drawn to assassins as characters, yes I do play Assassins Creed as well. Some of my favourite characters of my own are assassins and chaos magic plays a big part in my books as well. I have to admit that I haven’t really investigated the assassin characters for more than villains. They’re far too easy to pull out as a looming threat for the heroes. I think we tend to portray them as more mercenary types and evil guns for hire than honorable. Probably has a lot of wiggle room.